Growers who attend EcoFarm Conference will get exposure to tools of all types. On show in EcoFarm's Marketplace includes companies: Oggun, Man@ Machine, KULT-Kress, and Tend. Oggun is more than a tractor, it's a way of thinking. Our world changed in 1981 when Don Estridge of IBM, launched the IBM PC. Estridge made the decision, revolutionary for that time and place, that the machine would be made from off-the-shelf, easily obtainable parts and that the design specification would be made public. He changed our world forever. Had he not died in 1985 in the crash of Delta Airlines flight 191, he would be more famous than Bill Gates or Steve Jobs. What would happen if we built a tractor with all off the shelf parts and published the design? Imagine an Open System Agricultural World - Check out Oggun in booth B4. KULT-Kress is a leader in precision cultivation around the world. With headquarters in Germany and offices on both the west and east coasts of the US, the company is best known for its “fingerweeders” – a cultivation tool that eliminates weeds between plants in-row. 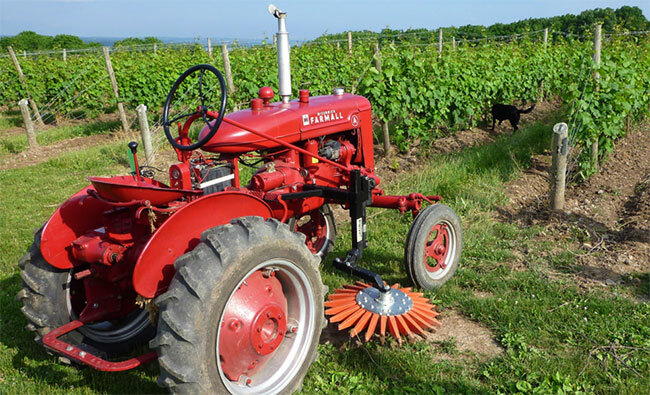 With these tools and others, KULT-Kress customizes each tool for a wide variety of applications – orchards, vineyards, row crops and vegetables – and based on soil type, row spacing and equipment. Mechanize your weeding by visiting KULT-Kress in booths E43-45. For fifteen years the Treffler harrow is renown in Europe. This past year Man@Machine introduced the Treffler machines into the US and Canadian markets. For all your vegetables, potatoes and cereal crops. These harrows are perfect for ridges, regardless of the height of the tooth, the pressure remains the same. For everyone with a plot of land, with the Treffler you can "harrow without sorrow." Meet Man@Machine in booth B15. Tend is the first software platform of its kind to integrate the growing and selling tools with advanced data analytics specifically designed for diversified and small- to mid-sized organic farms - from crop planning to harvest management, marketing to sales, and everything in between. Meet the minds behind Tend in booth A4. It's no secret that food production is energy intensive. With finite resources and a changing climate, farmers must become adaptive to their environment, not the other way around. Adaptive Agriculture requires us to farm within our specific context. One context we all share is the reality of global warming and dwindling fossil fuels. Steve Heckeroth of Solectrac has been developing a solution: a fully electric tractor, chargeable by renewable energy. How can agriculture adapt to electric technology? Learn about new tools and implements, and how they will help us adapt to our new reality. Learn more. Technology to the Rescue? Will Robots Save The Day in Ag? There has been a serious labor shortage in agriculture and it is getting worse. On a parallel course is the development of sophisticated robotic tools that assist the smaller labor force. In some ways these new tools are providing better working conditions for farm labor by eliminating a lot of the weed suppression with smart robotic weeders and thinning machines. Tillage, bed preparation, row cultivation, spraying and more applications using computer guidance are becoming available. Growers are streamlining the harvest operation and integrating farm workers into working with these new machines to keep production steady. Speaker Anthony Duttle of T&A Farms will introduce a few of the basic machines in use today and a look at the near future. Learn more. Small, diversified farms are labor intensive by nature. Managing dozens of different crops in fields and greenhouses can become expensive and inefficient. The right set of tools can provide the vision and precision to maintain a healthy, productive farm ecosystem. We will explore a broad range of innovative tools to ground your operation and ways to identify or create the right sequence of tools for your farming system. Speaker David Grau, a longtime farmer, designs and builds top-of-the-line wheel hoes and broadforks with Valley Oak Tool Company. He will show his brand new Mid Fork (between a broadfork and a digging fork) and an electric wheel hoe. Speaker Jack Algiere of Stone Barns Center works with Slow Tools, Johnny’s and other equipment creators to invent and modify tools for his 6-acre vegetable field and ¾ acre greenhouse. Learn more.